Here's a little factoid from WWDC that the Android Community is sure to hate. 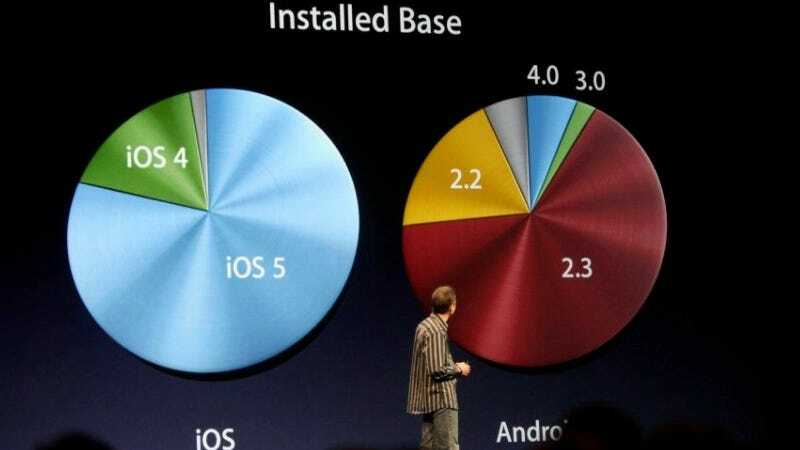 80 percent of iOS users are using iOS 5 (Apple's latest and greatest). Look at that little slice of pie for Android 4.0 (Ice Cream Sandwich). Ouch. To be fair, Apple had a head start here, but it's indicative of a real problem on Android. Manufacturers and wireless carriers are moving way, way too slow on updating devices. It looks bad. Very bad. They've got to pick up the pace if they're going to remain competitive with the others.